Regardless of how often you do your laundry, you should consider learning how to make a hanging clothes drying rack. One, you will save on the astronomical power bills associated with dryers. Secondly, homemade clothes drying rack help you make better use of your living space. 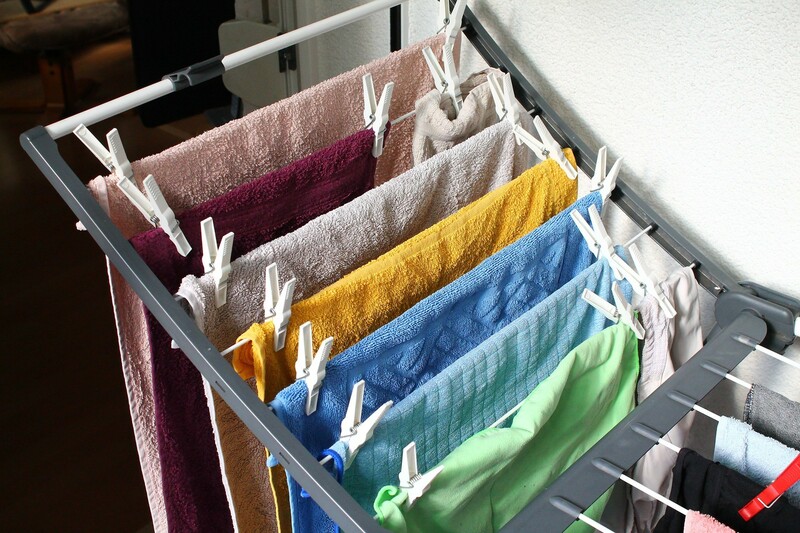 For example, a DIY folding drying rack occupies very little space when not in use. Now, the bit I like most about drying racks is that even if you’re not very enthusiastic about DIYs, they are very easy to make. They can be used to dry delicate items of clothing- the type usually destroyed by dryers. They’re cheap to make hence an excellent solution when you don’t want to spend on expensive drying machines. Drying racks can be made to fit into tiny rooms as well as being mobile. Perhaps the only drawback is the small effort required to assemble them. You may have a ladder that has been lying around for a while wondering what to do with it. Don’t dispose it off as of yet. You can re-purpose it to be your handy clothes drying rack by placing it horizontally across some strong bars or walls and tying it with a strong rope. You can also transform it into a handy drying rack by hanging it from the ceiling. If your kids have long out grown their crib, you can make it relevant by reinventing it as a drying rack. You can pick one of the sides, fix it onto a wall, and voila! You have a practical drying rack. Alternatively, you can mount it across 2 surfaces and hang clothes there– the same way you work with a ladder. Another option is hanging the side of your crib from a door. This could be particularly pleasing if you’re extremely short on space. In this case, you will first make a rectangular wooden – as we will see from our wooden clothes drying rack plans. Then you’ll mount a pulley that you no longer use on the ceiling. What remains now is just to use a rope to cleverly strap the wooden rack onto the pulley in a way that it can be moved up/down by adjusting the mechanism. As compared with the other two, this definitely has more work but works perfectly. A DIY folding drying rack keeps your clothes from shrinking. But what makes it even more popular is its space-conscious design. There are those who prefer to use PVC pipes instead of wood for his design and it still functions. However, for us, we find wood easier to work with so we will take that direction. Necessary tools: Drill bit set, screwdriver, a hammer, framing nails, and an electric saw. Using the saw,cut the cedars in half then rip them into 4 different pieces. With your drill bit set, drill 4 holes into 2 pieces – you will fit your wooden dowel rods in these. Ensure that your pieces remain symmetrical as you drill. Next, glue the 48″ cedar boards together while ensuring that the 2 drilled boards face each other. Cut your dowels to a good length then glue them in. As you do this, maintain the structure’s square (you can clamp it up to be sure). Now you will make a second set of frames from one of the remaining cedar boards. These will be very similar to the legs but you don’t need to drill the dowel’s holes as they will be used to make the brace usually fixed at the top of your rack. Spray your chosen paint on the finish and let it dry. Preferably paint it outside so as to avoid inhaling toxic fumes. It also dries up faster outside-especially if the sun is up. Clamp your two racks together and install the hinges. You may use screws which match the hinges (in terms of colors). Lastly add a leather strap which will act as a stop so that your rack doesn’t open beyond a good angle which may cause it to collapse. That’s all! Your DIY folding drying rack is ready for deployment. Since your laundry room will not always be large, this model could be another alternative. You can simply make a stable PVC piping frame then cover it with some form of netting. Then, you screw the completed frame into a cabinet drawer’s slides. This is the recommended solution for drying out all of the delicate clothing. If you have a jumper with a do-not-tumble-dry warning or a fragile shirt, then the drop-down rack will become your favorite. The biggest advantage with these is that you pull them out only when you have some clothes to dry otherwise they remain folded up flush against walls. Also, you can build them to have more rungs so that you can dry several layers of clothes simultaneously. As you can see, learning how to make a hanging clothes drying rack is fairly simple yet it brings you lots of savings in space and energy bills. Try the above steps and see if you’ll triumph. If you do, you’ll find drying your clothes easier, inexpensive, and more flexible.